Just because it’s summer doesn’t mean we can’t take a breather from maintaining that summer body – especially if it’s indulging in a healthy dessert option made with Zucchi Organic Extra Virgin Olive Oil. Plus, I’m always trying to watch the calories and indulge smartly. 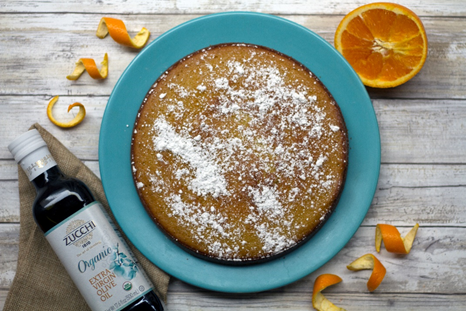 Perfect for Summer BBQ’s, rooftops, or the beach, Olive Oil Cake made with Zucchi Organic Extra Virgin Olive Oil makes for a refreshing and light warm weather treat. -Heat the oven to 350° Fahrenheit. Spray a 9-inch cake pan with cooking spray. -Whisk together the following ingredients: flour, sugar, salt, baking soda and powder. In a separate bowl, whisk the olive oil, milk, eggs, orange zest, and fresh OJ. -Add the dry ingredients to liquid batter and mix well. Pour the batter into the prepared pan and bake for 45 minutes-1 hour; you’ll know when it is ready when the top is golden brown and a toothpick comes out clean. -Transfer the cake to a rack and let cool. -Optional topping: powdered sugar or whipped cream.